A screengrab from the game. A VIDEO GAMES company has removed a school shooting video game from its online platform following widespread backlash. 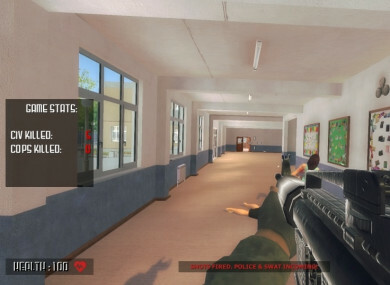 The Active Shooter video game was pulled days before it was to be released on the video game marketplace Steam. Valve Corporation as Steam’s parent company said that it was removing the computer video game because the developer was a “troll with a history of customer abuse”. The game was developed by Revived Games, published by Acid and led by a person named Ata Berdiyev. Valve spokesman Doug Lombardi said Berdiyev had previously been kicked off the platform under a different business name. The Seattle Times reports that an online petition urging Valve to pull the game before its scheduled 6 June release had more than 100,000 signatures. Valve is a privately held company which has developed popular games such as Dota 2 and Half-Life. Email “School shooting video game removed online after backlash”. Feedback on “School shooting video game removed online after backlash”.